A gang of teens in South London defend their block from an alien invasion. The biggest surprise in writer and director Joe Cornish's scifi/horror "Attack the Block" is an underlining theme of morality. What makes this morality so thoroughly intriguing is it comes in the form of foul-mouthed hoodlums residing in South London's public housing. Hoodies (as they are called in the UK) that you should be afraid of. The oddity is instead of frightening the audience they end up teaching them a lesson. This is a remarkable feat on its own except that is only the tip of the iceberg in what makes "Attack the Block" one of the most gratifying experiences of not only the summer but the entire year. More about the hoodies or gang members that carry “Attack the Block.” These boys do a fantastic job in their roles. Joe Cornish’s script houses an engaging group dynamic between the main characters and the actors bring it to life in an unmarred fashion. These boys evoke memories of “The Monster Squad,” “Stand by Me,” “The Lost Boys” and other enjoyable movies that highlight an ensemble of kid actors. While Cornish’s script and the actors can remind us of previous similar dynamics, this group and movie stands on its own without waiver. This is a group of kids that you become their friends over the course of the film. You laugh at their jokes, get scared when they are and hope the best for them. Much of that is because director Joe Cornish and casting director Nina Gold did an amazing job with the young actors. First and foremost John Boyega in the lead role of Moses. Boyega is only going to get more roles after people see him in this, a true talent. The rest of the hoodies are also brilliant throughout. Leeon Jones as Jerome, Sammy Williams as Probs, Simon Howard as Biggz, Jumayn Hunter as Hi-Hatz all play there parts without hesitation and come across as naturals on screen. Alex Esmail deserves specific recognition as Pest, this kid is a good part of the comic relief in "Attack the Block" and another actor I hope to see finding more roles in the future. One huge way the film sets itself apart is dialect. These South London hoodies have a very distinct slang they use throughout. The lingo could come across hard to understand at first, but once the movie is moving along, audiences should have no problem keeping up. In fact the vernacular used is so catchy, audiences will find themselves walking out mimicking the UK jargon. Another thing that is catchy in "Attack the Block" is Steven Price's score. Using the term "catchy" actually does not do the score any justice, a better way to describe it is infectious. Price's score is absolutely addicting and enthralling all the way through. From the terrorizing moments to the white knuckle chase sequences the music really adds another layer to an already exhilarating ride. Too often movies involving kids make a point to be kid friendly meanwhile, “Attack the Block” is not afraid to be dark at all. Younger audiences may want to steer away from the R rated thriller, but as a parent, I would allow my 6 year-old son watch this movie without reservation. The movie relishes the fear and thrill it contains yet it remains an adventure. Joe Cornish did an amazing job creating a balance between scares and comic relief. Most of the comedy is wisely used to ease the tension created by the terrifying alien invasion. One scene in particular that is sure to generate cheers with audiences is the "tooling up" sequence. "Tooling up" in the UK is the equivalent to getting weapons for audiences stateside. Think of Rambo suiting up, sharpening his knife, tying his bandanna around his head and getting a bunch of guns except with a bunch of teens who are finding household weapons to kill aliens not actual guns. Watching a movie about an alien invasion, I bet you are wondering how the aliens look? For my money, Joe Cornish and the effects crew hit a home run. The monsters/aliens in “Attack the Block” are downright scary. These ape-like looking figures are black as night and ruthless to no end. The film goes a long way by creating creatures that aren’t really definable. Even when the audience gets a good look at them, they are so vacuous and dark it is hard to pinpoint their identity. Something else that really helped the adventure along is the presence of physical creatures. While there is some cgi utilized, most of the time we see the hoodies running from the creatures, they are actually being chased by a physical being and not just a computer graphic created in post-production. This may seem like a non-factor but having Terry Notary in an actual suit chasing the actors really helped to build a true sense of fear and terror. Writer/director Joe Cornish was smart to not re-invent the wheel with "Attack the Block," in fact he plays off a number of tropes associated with multiple scifi action movies yet he manages to keep the audience guessing. The best survival movies never allow the audience to know exactly what will happen next keeping the suspense and thrills at a maximum level and thankfully Cornish's thriller can be lumped in that group. There is a brilliant sense of unknown (as well as fear) that looms throughout the 88 minute adventure. The audience is never really allowed to totally relax or feel at ease because there could be something vicious lurking around the corner. Overall "Attack the Block" is a must see movie in 2011. It has an invisible cast that helps to breathe life into the titillating script penned by Joe Cornish who in turn directed one hell of a thriller. It is a movie that pushes all the right buttons when it comes to scifi, action and horror. On the surface it is a satisfying adventure full of thrills, laughs and scares but as I said earlier it also houses some strong morals woven in. Friendship and integrity as well as teaching the audience and the characters within the film about judging others. 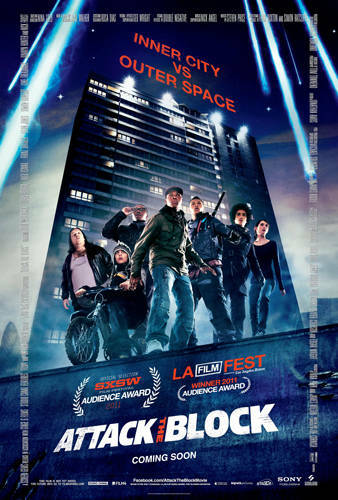 "Attack the Block" is all kinds of fun and well deserving of multiple viewings but above all that, it has some lessons to teach and I really appreciate the extra effort writer/director Joe Cornish put in to make an already captivating film even better.